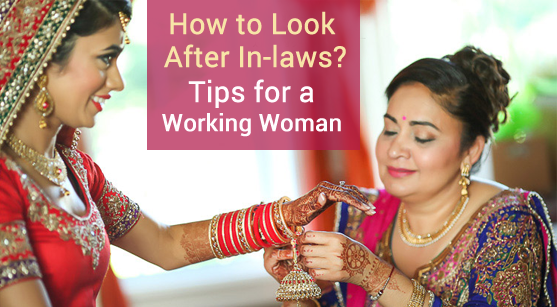 Handling in-laws is probably the toughest task that a girl can come across in her marriage. While the things between the couple just fall into places after they know that they are compatible, it will take a lot more efforts to please one’s in-laws. It becomes even tougher if you have a regular job and have to look after the home too. But, you cannot actually ignore the in-laws as having a good bond with them is vital. Be calm. Patience is your greatest weapon. You will have to be very calm and cool about what ever issues that arise at the home. Any situation becomes as serious as your reaction is to it. So, if your in-laws are rude or pass any comment, try not to retaliate immediately. Give some time and then act. Think of why they are saying something and try to see from their point of view. A majority of Indian men are mamma’s boys. You must accept the fact before you go into a new household. Men listen to their mothers and find them as sacred as Gods no matter what they are to the others. So, do not try to disfigure the god in your husband’s mind. Let him love his parents and you must not interfere in their relationship. Always remember that the first year of marriage is the most difficult year. You will have to adjust to the household, their habits, food, culture and even lifestyle. Learn slowly but steadily. Try to embrace their lifestyle. But, it does not mean you must change. You can always introduce your food habits, lifestyle and hobbies to your in-laws too. They will surely welcome the change. Never volunteer to do the entire chores of the household just to impress them. You will be stuck up with the responsibility until the end. Share the chores equally between all. This is when the husband should step in and help his wife by lending a helping hand in small stuff like bringing grocery, watering plants or doing the laundry. Never ever accept anything that is demeaning and insults yourself respect. As a daughter in-law it is your responsibility to look after your husband’s family. But that does not mean you should take nonsense from them. Be firm about your place and the respect that you ask from them. Being a super daughter in-law is a very hard job that you must take up along with your regular career. While there are no payments or hikes in this job, there sure is the respect and love to be gained from the senior most people in your husband’s home, your in-laws. If you balance both the works, you will be a dear daughter in the house, not a daughter in-law. There are several Punjabi matrimonial services that can search for you the best groom who has the best parents. Once you decided to get married, you should prepare yourself in meeting your husband's first love. You are blessed if you have a loving and caring mother in law, because some have "monster" mother in law. Thank you for these tips very helpful & useful, unlike the ones that I read at http://alltopreviews.com/services/bestessays, unreliable and inaccurate. As they say, when you marry, you'll also have to marry your in-laws. This I read when I find help writing paper for marriage counseling. But when you marry, you should be emancipated from your parents already. But the respect and love for your parents/in-laws should not falter at all. And even if they sometimes meddle with family/marriage matters, you should try to listen but it doesn't mean that they have to dictate every move you and your spouse should do. At the end of the day, the two of you should decide whatever problem/agenda you may have. Awesome post, please suggest some best Punjabi matrimonial services in Delhi for brides.